This looks amazing ….I don’t eat the onions either! Haha. Pictures are incredible as usual. 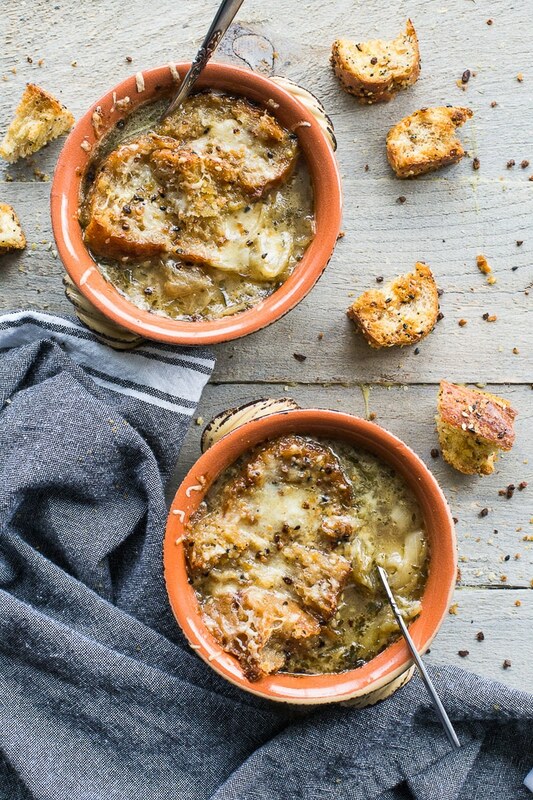 One of the very first recipes I shared was a french onion soup with bone marrow toast. 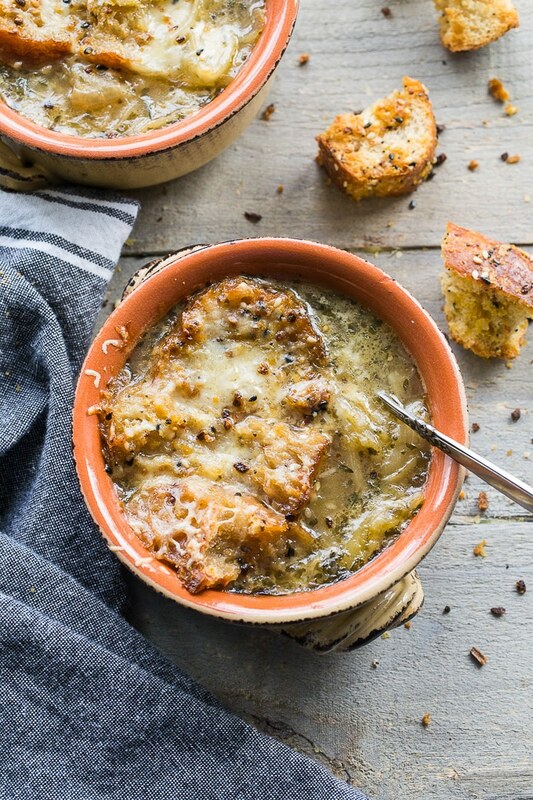 I love french onion soup because it has such a rich, savoury flavour and then, of course, there’s bread and cheese. I totally agree with ya….it does take time to develop that flavour, but oh so worth it. Your hubby had a great idea using the bone broth in this one. Genius….now if you could only get him to eat those onions 😉 Anyway, extra for you, hey?? Haha! Yes, the hubby did have a great idea. He gets to enjoy a bowl of broth and lots of bread and cheese, and I eat a bowl of onions! 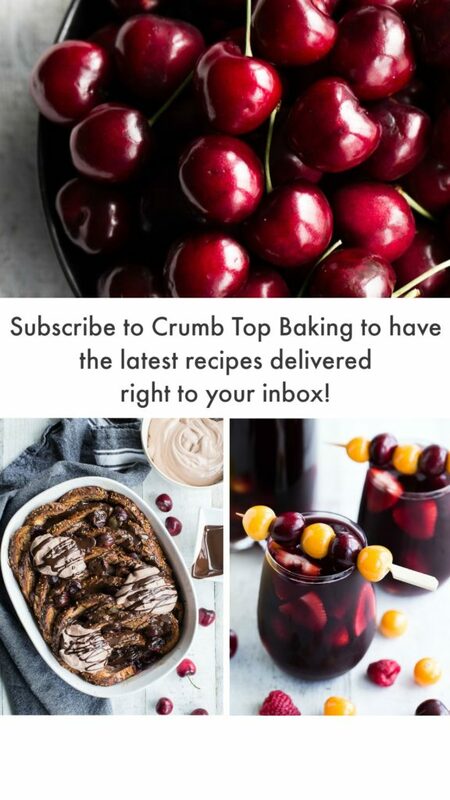 ;) I’ll have to check out the first recipe you shared. You can never have too many soup recipes for the colder fall and winter season! I absolutely agree that getting flavor out of those onions takes time, but totally worth it! I can already smell this soup, divine!! Thanks Neha! Yes, I think it was totally worth it too! This soup sounds so cozy and delicious! 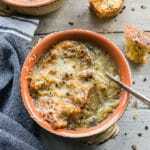 I’m a huge French onion soup lover–mostly because of the cheese :). I’m going to have to try this ASAP because we’re expecting storms over the weekend. Just give me a bowl of this and some good movies and I’m set. Happy almost-Friday! Thanks Kelsie! I hope the weather wasn’t too bad over the weekend. 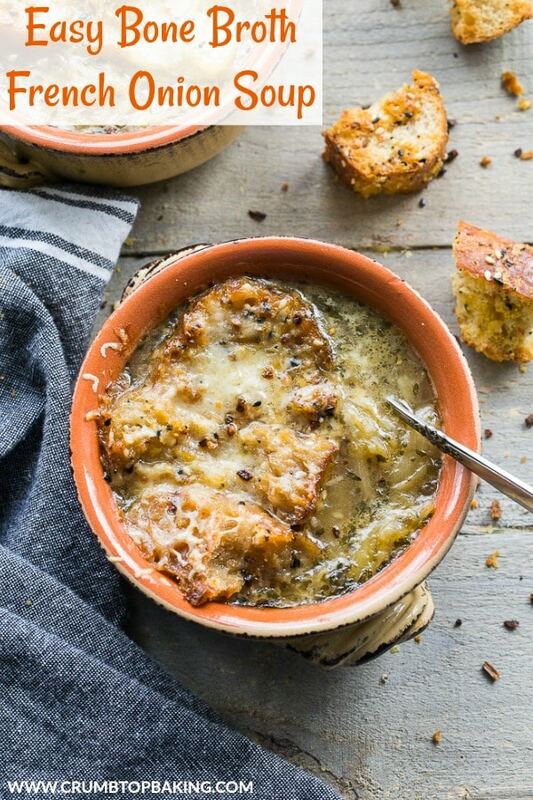 I agree, the cheese is a delicious part of French onion soup. Probably why my hubby eats it!! 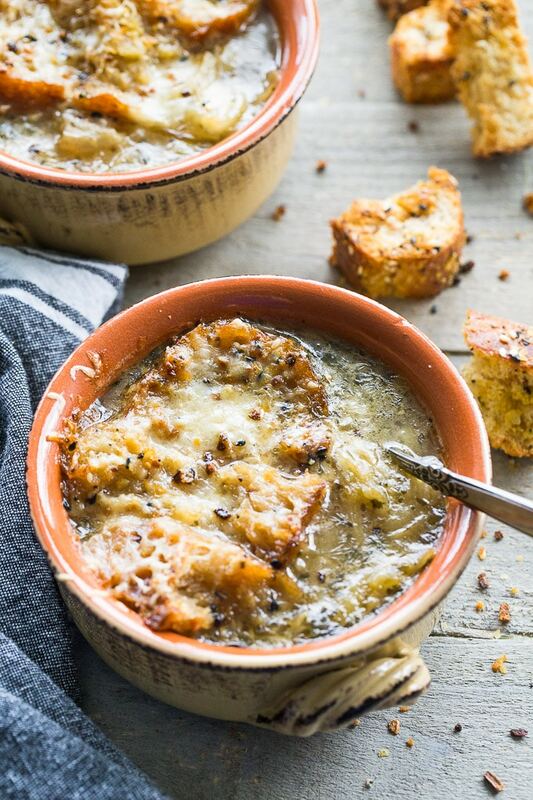 There’s nothing like french onion soup and I love that you used bone broth to intensify the flavor! I’m waiting for cooler weather next week so I can really dive in and enjoy soup more. This looks so inviting! Thanks so much Marcie! I hope you get some cooler weather soon so you can fully enjoy soup season!! This soup is perfect for Fall! I love how you used bone broth to really flavor this soup 🙂 I’ll take a bowl (or two…or three)!! Haha! Thanks Kelly! Seconds and thirds all around! Love a hearty soup for fall! 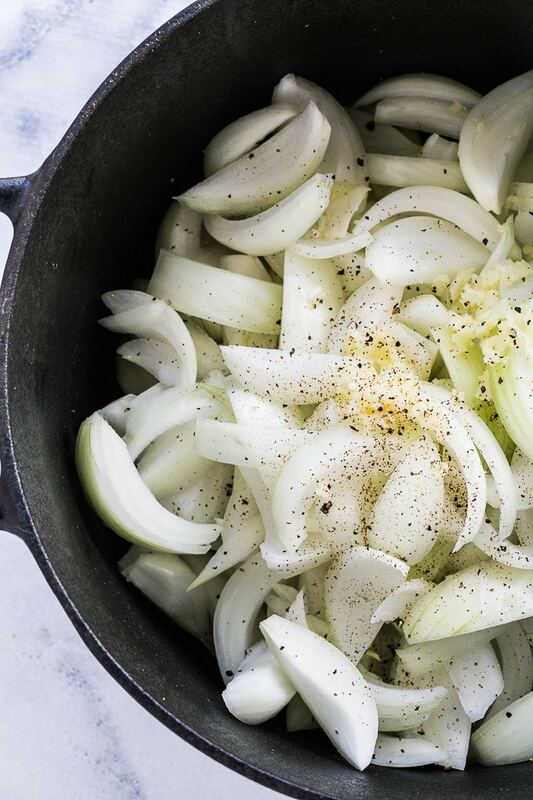 Coaxing the flavor out of onions does take love and care but is 100% worth it! I just want to grab a spoon and reach into my screen and grab a bowl Leanne! This looks fantastic! Thanks Mary Ann! Wouldn’t it be great if we could do that?! Haha! This looks so hearty and delicious!!! We just ordered French onion soup at a restaurant the other day, and yours looks even better than the one we got! Plus you get the benefit from the bone broth. I’m definitely trying this one soon my friend! Happy weekend! Thanks Katherine! So nice of you to say! Hope you get to make it soon! Have a great week! 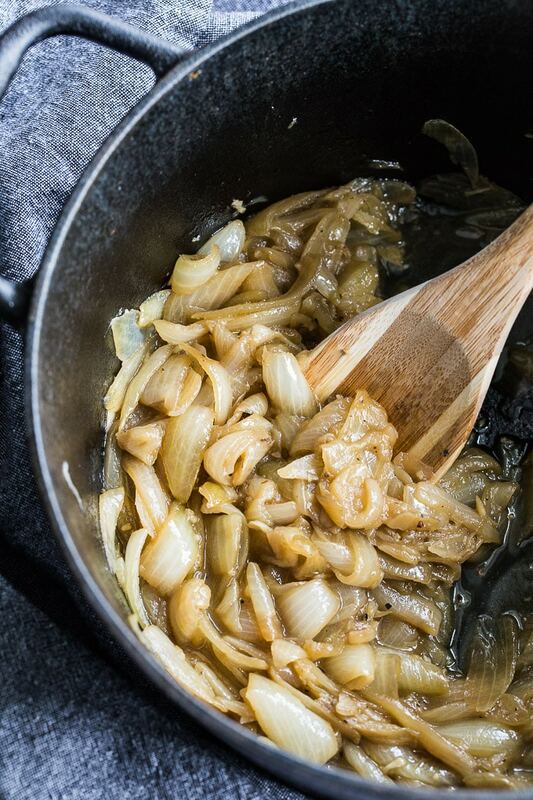 That photo of the caramelized onions is amazing! YUM! So much flavor in this soup. Love the cheesiness and the crunchy croutons! Perfect Fall food. Great recipe, Leanne! Thanks so much Haylie! I was surprised the onions photographed so well. They don’t always look appealing when they are caramelized. But so tasty! Thanks Dana! The powdered bone broth is super convenient, especially if you don’t have a lot of fridge or freezer space. Sorry you can’t enjoy the onions, but you could totally take a page out of my hubby’s book and enjoy a bowl of broth with cheese and croutons! 😉 Have a lovely week! I didn’t even know bone broth powder was a thing! 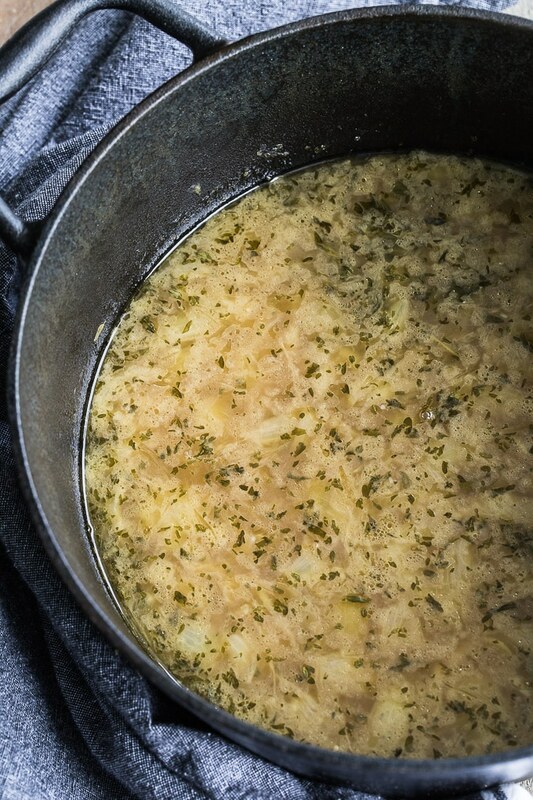 That is very helpful to make a quick bone broth – saves hours! I love the everything bagel spiced croutons – a new twist of flavor on an old favorite! 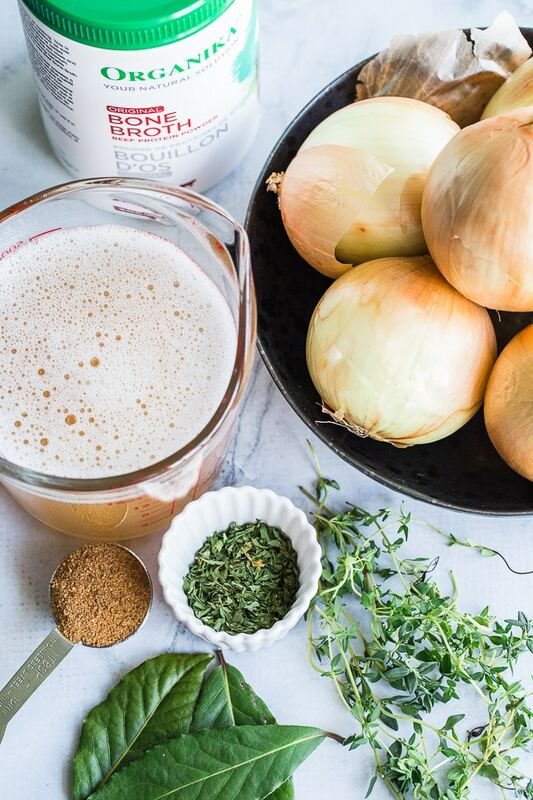 The bone broth powder is a huge time saver! And the croutons are the only ones I make these days. The everything bagel seasoning is so addictive! Have a great week Kelly!